There are some, perhaps many, who would proclaim that surely those who were cheating on their spouses needed to be outed. After all, these people were in sin. They were breaking one of the Ten Commandments – “Thou shalt not commit adultery.” Don’t you like the way I utilized the King James Version? These people needed to be stopped. Come on pastor, you should be glad that these people, along with their sin, were exposed. Well you, those having those thoughts, might be surprised. Let me begin that by saying that I do not condone adultery or any sinful behavior. I don’t condone it in others, nor in my own life. It is offensive to the Lord, our Creator, and no matter what we might believe, sin always damages our own lives and the lives of others. Secondly, let me be clear about this . . . I am a sinful man, but let’s not stop there. Almost without fail, I attempt to hide my sinfulness from others. There are several reasons for concealment. I don’t want to disappoint others – As a Christian, we are taught to surround ourselves with other Christians for encouragement and accountability; therefore, I am going to have to face their disappointment and correction. I think I can limit the pain – If others don’t know, then perhaps they won’t be hurt. I am ashamed – By far, if there is anyone who should know what sin is, it is a Christian (especially a pastor). How could we do what we know we ought not to do or not do what we know we should do? I don’t want to face/endure the consequences. Sin always carries a cost . . . always. I certainly cannot quantify that cost for any particular sin, but I do know that without the forgiveness of the Lord, the cost of sin is death. My point is that God has always been about exposing truth, BUT that truth has always been coupled with or couched in his love. That is dramatically different than singularity of truth ABSENT of love. Although I do not know the hackers, nor their motivation for leaking the millions of names from the Ashley Madison website, I do know this. Because the truth has been exposed absent from love, a great deal of damage, heartache, and now, even death has been the result. When one looks at Genesis 3 (the very first sin committed), notice that the Lord exposes the sin, but he also presents for the first time the gospel (Genesis 3:15) and then he covers Adam and Eve’s nakedness. He DOES NOT leave them exposed. God does not have the attitude, “I caught you. 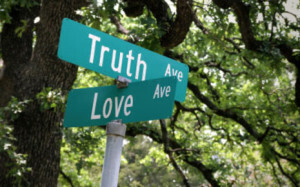 Now, you deal with your nakedness.” I have often heard people, even Christians, justify gossip and hearsay simply because it is “the truth.” Where is the love? Where is the care and compassion? As Christi Gibson stated, “These were (are) real people with real families, real pain, and real loss.” In Matthew 18, Jesus makes it clear that when sin is known the goal is not proclamation and humiliation. The goal is repentance and restoration. That is why the very first attempt toward the goal of repentance and restoration, Jesus said, “go and tell him his fault, between you and him ALONE” (emphasis mine). The church (a large group of people) is not involved until later and only if repentance and restoration is not achieved. Perhaps all of us have been guilty of exposing truth and feeling that we have somehow been Christlike or Godly in our actions. The real truth is that apart from the love of Christ, we are simply coconspirators in what Satan loves to do, “steal, kill, and destroy.” An example of that destruction is on national display through the death of John Gibson. I hope that John never questioned the grace, mercy and forgiveness of the Lord. Perhaps he did struggle to forgive himself, but I wonder. I wonder if John Gibson contemplated if the grace, mercy and forgiveness that he had extended to so many people would be extended to him by those same people. Perhaps his conclusion was doubtful at best. Perhaps that is what terrified him the most. May we never be a part of proclaiming truth apart from love and may we never applaud or admire this type of behavior. There is nothing Christlike about it. Welcome back Pastor, and what a good point this is. We as the church must learn to take a position where we err on the side of grace when dealing with other’s sin. We must not condone sin, especially when the individual involved is not repentant, however by responding in love we can lead the person to repentance and reconciliation.